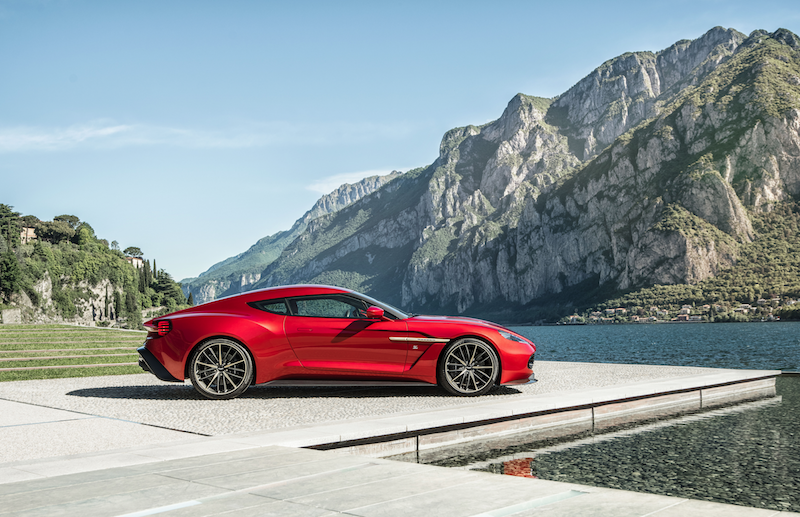 Back in May, Aston Martin and Italian-based brand Zagato unveiled yet another astonishing and groundbreaking concept vehicle at the Concorso d’Eleganza Villa d’Este in Lake Como, Italy. The Vanquish Zagato is the fifth car created by the partnering luxury brands, and recently Aston Martin released that it will no longer be just a concept. That’s right, the Vanquish Zagato will be manufactured in a limited edition series released by Aston Martin. “The Vanquish Zagato Concept shows how out two companies can come together and push the definition of Aston Martin design,” says Aston Martin Executive Vice President and CEO, Marek Reichman, in a press release. Both the exterior and interior design of the Vanquish Zagato embodies bespoke fixtures, which ultimately adds to the luxuriousness of the superior vehicle. The Vanquish’s features make the vehicle look incredibly futuristic, especially due to the backend bodywork, which sculpts inwards. The Vanquish can go from 0 to 60 mph in 3.5 seconds and has a 6.0L V12 powertrain. Other features include lights with round tail reflectors and LED capabilities (similar to that of Aston Martin’s Vulcan), retractable spoiler and rear hatch and quad exhaust. But that’s not all. Other bold details on the Vanquish include wheel arches and Zagato’s signature touch—a double bubble roof, making it possible for the rear to curve the way it does. The exterior is not the only luxurious feature to the Vanquish. The interior boasts just as many new features as the exterior such as Herringbone carbon fiber and optional leather on the dashboard, Z quilt pattern on the seats and doors and an iconic Z engraved into the headrest and center console, to allow any passenger know what car they are driving in. Watch Aston Martin’s video on the Vanquish Zagato below. To learn more about the limited edition vehicle, please click here.